Angola clinched a place at the Africa Cup of Nations finals in Egypt with a 1-0 win over hosts Botswana on Friday to finish top of Group I.
Burkina Faso's 1-0 win over, the already qualified, Mauritania was not enough for the Stallions to qualify for the finals. The results mean that Angola top the group ahead of Mauritania thanks to the better head-to-head record, with both teams on 12 points. The duo end the campaign two points ahead of Burkina Faso with Botswana bottom with just a single point. Wilson Eduardo was the hero for the Palancas Negras as he scored on his debut after swapping national allegiances from Portugal to play for Angola. Eduardo, whose younger brother Joao Mario plays for Inter Milan and Portugal, scored midway through the first-half. The match was meant to begin at the same time as Burkina Faso and Mauritania but eventually ended almost 20 minutes later. Kick-off in Francistown was 10 minutes later than Ouagadogou and floodlight failure at the start of the second-half delayed the game even further. Burkina Faso got the win that they needed to have any chance of reaching the finals thanks to a goal from Lyon's former Chelsea forward Bertrand Traore after 19 minutes. They then had to endure a 20 minute hoping for a Botswana equaliser which never came, that would have have seen them qualify for the finals. The hosts started well when Mohamed Mokhtar was on target after 15 minutes. 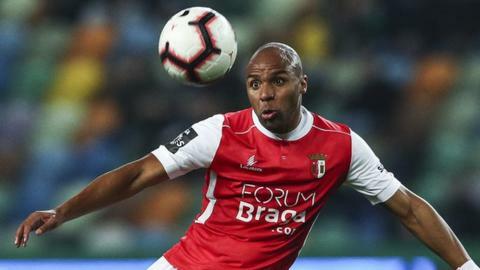 The lead lasted just four minutes before former Middlesbrough and Mallorca player Emilio Nsue equalised from the spot and added another penalty before half-time. Spain-born Pablo Ganet, who plays in the Spanish third division for Algeciras, added a third goal four minutes into the second half. The win was completed when West Ham midfielder Pedro Obiang scored his first goal for the Nzalang Nacional in the 85th minute. Already eliminated Malawi held qualified Morocco to a goalless draw in their final Group B game. Some of Morocco's best chances fell to Rashid Alioui, who hit the woodwork on three occasions. The closing minutes were marred by crowd trouble at the Bingu Stadium in Lilongwe, as fans threw missiles onto the pitch. The Gambia could only get a draw against group leaders Algeria on Friday, meaning that their qualification hopes are over. The Gambia needed a win and for the result to go their way in the Togo against Benin match on Sunday. Algeria led through a Mehdi Abeid goal in the 42nd minute but The Gambia got an equaliser in second half injury time through Mamadou Danso. On Sunday Benin will qualify with a win or a draw in their clash with Togo, who can also qualify with a win. In another match that was effectively a dead rubber Nigeria ensured they will finish top of Group E with a 3-1 win over Seychelles, who had already been eliminated. China-based striker Odion Ighalo broke the deadlock for the hosts in the 35th minute from the penalty spot after Leicester City's Wilfred Ndidi was fouled in the area. Striker Henry Onyekuru, who is on loan at Turkish side Galatasaray from England's Everton, restored the lead for the Super Eagles with a header seven minutes after the break. Moses Simon, who plays for Levante in Spain, sealed the win with a goal in injury time. South Africa and Libya play each other on Sunday to decide who will join the Super Eagles at the finals in Egypt. The match is being played in the Tunisian city of Sfax due to the ongoing insecurity in Libya. A draw will be enough for South Africa to qualify while Libya only a win will see them progress. Senegal host Madagascar on Saturday in the other Group A encounter with both sides having already qualified for the finals in Egypt.